If you've ever wondered about what a table saw can really do, look no further. Introducing the new JET 10 in. DELUXE XACTA Saw. The Quick release riving knife and integrated arbor lock keeps the operator safe and more efficient. The DELUXE XACTA Saw offers an upgraded Poly-V belt drive system for smooth operation and optimal power transfer, a fully shrouded blade for highly efficient dust collection. The 26 in. x 30 in. wings and deeper table gives you even more cast iron to work on. A built-in 12.5 in. x 18 in. x 4 in. Storage drawer sealed from the cabinet keeps your necessities within arms reach, also includes an on-board fence and miter gauge storage. 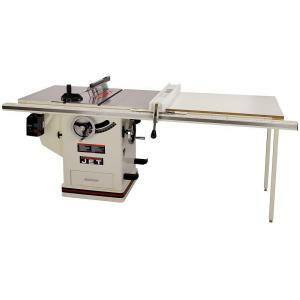 Tbook.com crawls the web to find the best prices and availability on Table Saws and related Tools and Hardware products like JET 3 HP 10 inch Deluxe XACTA SAW Table Saw with 50 inch Fence, Cast Iron Wings and Riving Knife, 230-Volt. For this page, related items include products we find that match the following keywords: "Table Saw" at our vendor partner Home Depot. JET 3 HP 10 inch Deluxe XACTA SAW Table Saw with 50 inch Fence, Cast Iron Wings and Riving Knife, 230-Volt is one of 60 Table Saws and related products listed in the Tools and Hardware section of Tbook.com If you have any questions on this product, please give us a call at 734-971-1210 during the hours of 9am - 5pm EST for assistance. Thank you for shopping at Tbook.com, the Internet Department Store!